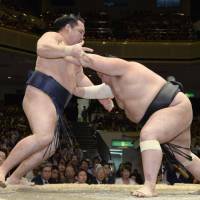 Disaster struck for yokozuna debutant Kakuryu after he was sent out to a second defeat at the hands of newly promoted komusubi Chiyootori on the seventh day of the Summer Grand Sumo Tournament on Saturday. Hakuho, meanwhile, rolled to 7-0 with another ironclad performance against hapless veteran Kyokutenho (0-7) in the day’s finale to move a step closer to winning his 29th career championship. Ozeki Kisenosato is one behind the yokozuna along with rank-and-filers Kitataiki and Ikioi at 6-1. Kakuryu, who lost to Endo on the fourth day, appeared in trouble from the get-go as he retreated after a hard crunch at the tachiai. 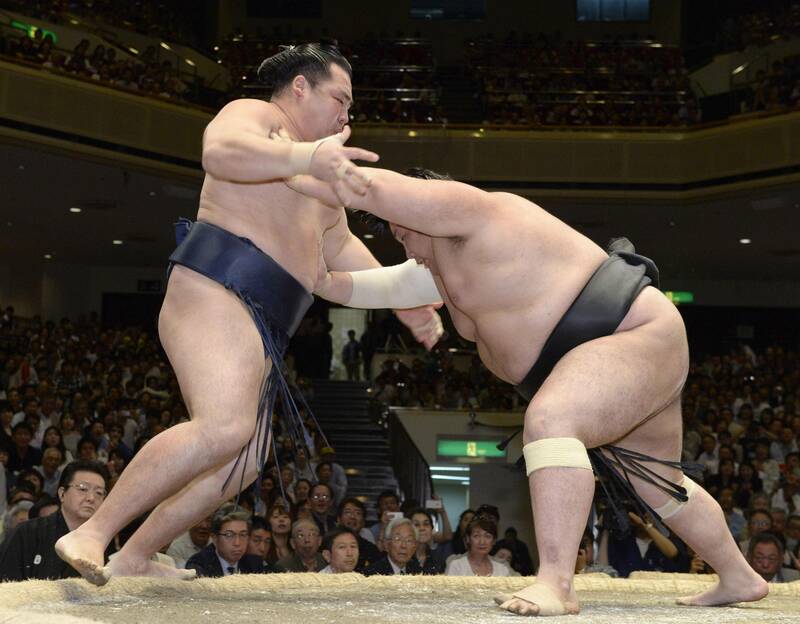 Chiyootori (2-5) came blazing forward to send the yokozuna over the straw bales at Ryogoku Kokugikan. Harumafuji rebounded from a loss to Toyonoshima on Friday, smacking down popular maegashira Endo (4-3) from the left when his opponent’s feet slipped into the splits. Aoiyama (3-4), who beat Kisenosato on the fourth day, rolled like a freight train over Kotoshogiku, pounding the ozeki with a barrage of slaps to send his opponent retreating to a third loss. But Kisenosato was all business as he went on the rampage to back out rank-and-filer Chiyotairyu (1-6) in a matter of seconds. Tochiozan upended fellow sekiwake Goeido in a lopsided affair, leaving both men at 4-3. In the lower echelon, Egyptian Osunaarashi (4-3) saw his two-day winning streak come to a halt when he was tossed down with a beltless arm throw by veteran Kitataiki.